Indigenous readers please be aware that this page contains the names of deceased persons. Indeed, the book’s provenance is a story in itself: it reveals a different way of thinking about authorship and autobiography. The book began in 1998 when Rubuntja asked for help to record his life story, and received a grant from the Australian Institute for Aboriginal and Torres Strait Islander Studies (AIATSIS) to help with the research. The text came together from taped interviews with Rubuntja between 1975 and 2001, mostly recorded by linguist and artist Dr Jenny Green, but also by teams of other interviewers. Jenny Green also contributes additional commentary and so does historian Tim Rowse. (Dr Green won the 2011 Chancellor’s Award for Excellence in a PhD Thesis for her work on telling Australian sand stories, there’s a lovely photo at this link). Though all authorised biographers respect the wishes of their living subjects and may have to negotiate ‘no-go’ areas, this community-based autobiography combined with cultural prohibitions is, I suspect, quite a different approach to the usual practice of autobiography … It gives the book an authority that derives from thousands of years of a living culture even though it is using all the modern accoutrements of publishing. There are also occasions when the commentary acknowledges that accounts of the same event are not necessarily the same. IMO this actually reinforces the authenticity of the book, because everybody knows that people often remember the same event differently! I found this distinctive approach very refreshing, but it also made me wonder how different the book might have been had it not been published while Rubuntja was still alive. I haven’t finished reading the book, but I wanted to share my thoughts about it now because NAIDOC Week kicks off tomorrow but I will be spending most of the day in transit to Queensland. (It’s my usual term holidays trip up to see that all is well with my elderly parents.) 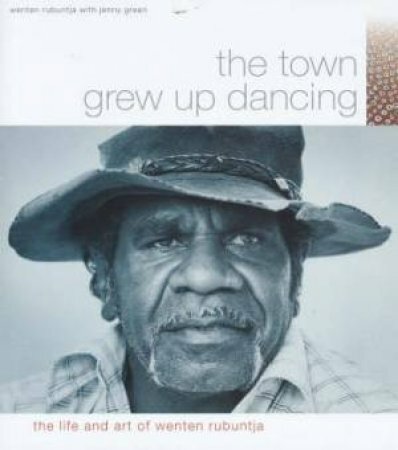 The Town Grew Up Dancing is a book that’s ideal to kick off my reviews for Indigenous Literature Week 2014, so I’ve scheduled this review to coincide with that. It is a biography of a very significant indigenous man but it’s also a beautiful book of beautiful art! I found it very interesting to read the chapter called Army Time because I’ve been working on a unit about indigenous war service for my year 5 & 6 students. The impression I had from the resources supplied by the Shrine of Remembrance and the Australian War Memorial was that Aborigines were keen to enlist, even though they were subject to insulting, racist restrictions which prohibited them from doing so in WW1 and only allowed to join up in WW2 if they had a European parent. But this chapter makes it clear that some of them were ‘shanghaied’ into working as labourers in Ww2 and paid a pittance for doing it. I need to find out more about this: fortunately the book has extensive references so I may be able to give my students a more truthful picture of these events in due course. This is the real value of this book: without self-pity it reveals the extent of everyday discrimination that was routine in Rubantja’s young life. From being excluded from visiting the town of Alice Springs to his itinerant work history, Wenten could very easily have drifted into a life without purpose, but he took opportunities whenever they arose. He learned to paint by watching Albert Namatjira, integrating western art with indigenous concepts especially in terms of land rights. To give just one example that explains the complexity of Aboriginal Dreaming paintings, there is one called Ayeparenya (caterpillar) Dreaming, painted in 1986 and presented to Pope John Paul II when he visited Alice Springs in 1986. Three large concentric circles represent Heavitree Gap, Emily Gap and Simpson’s Gap, linked together by tracks and trails and other circles representing other places. These circles are the song – everyone has some sort of song which was created in the country they belong to – and there are countless black dots representing men and women dancing. So this painting shows that everyone has their traditional place. Rubantja’s role as an activist for Land Rights drew on many skills – as a mediator between different Aboriginal groups, as a diplomat, and as an indefatigable leader. I wish I could show you the poster entitled Two Laws Together from 1990 which depicts an Aboriginal man straddling two paintings: one in the Namatjira style with a landscape of mountain and trees, and the other a caterpillar dreaming story of the same place. This poster is symbolic of Rubantja’s understanding that reconciliation meant both cultures respecting each other.